I, unfortunately couldn't seem to come up with anything for the ribbons but I did make three items. 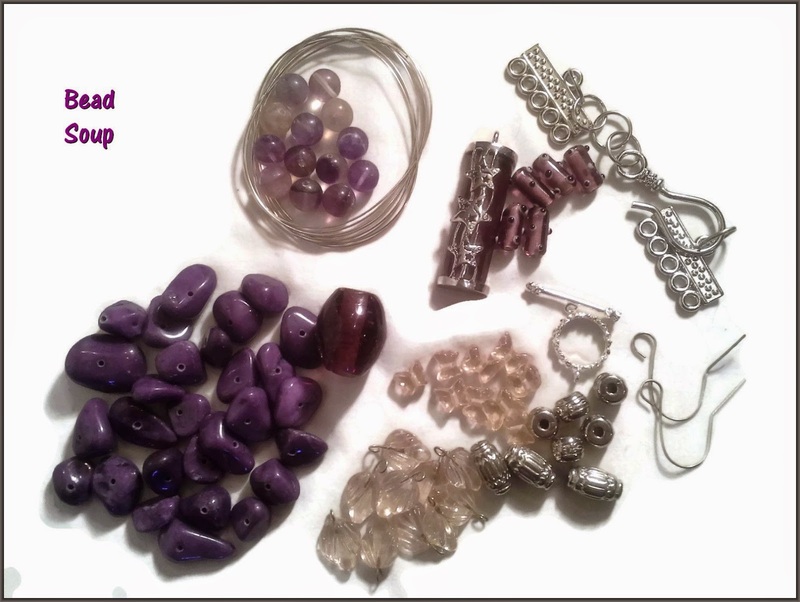 1) Using the purple beads, focal and very beautiful clasp along with some of my own beads, (I wanted to pick beads that complimented her beads but didn't not take away from them. I hope I succeeded.) This is what I created. 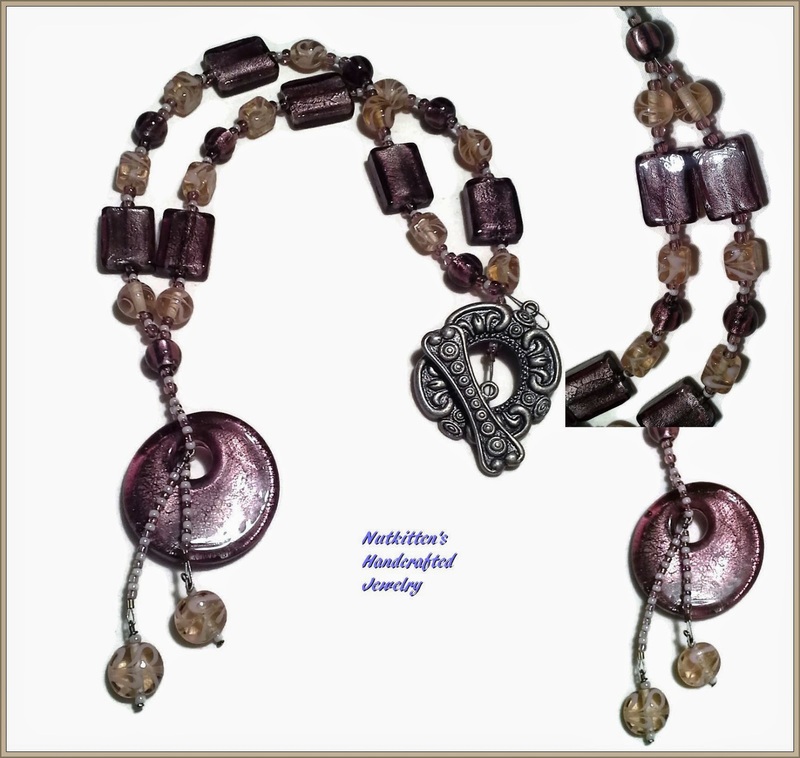 Necklace using purple beads, focal and clasp. 2) I also made a bracelet using some of the flower beads she send along with some flat flower beads and leaves from my own stash. 3) She sent a few paper beads she had made and was hoping I would try to use them. I really didn't know what kind of beads you would use with paper beads so I made a simple bracelet using a few seed beads as spacers. (the paper beads are really very cute!) Nice work Terry! Simple bracelet using paper beads. I hope everyone like the items I created. You did a fantastic job with all of it. I love what you did with the flowers. (hope your feeling better). Great job! I really like that bracelet...A LOT! If was great being your partner, sure hope you are feeling better. You made some lovely creations ! I wouldn't have thought to use a focal with a big hole the way you have, most likely - the end results are splendid ! Donuts focal are beautiful but not easy to use, your necklace is perfect though! I love the color combo, perfectly balanced, and also the paper beads are super! Beautiful pieces, all of them. Especially I love the bracelet, thats summer. So so pretty, I hope you are doing ok, your designs are beautiful. Pretty pieces. I love the purple set. It's something I would wear. Hiya! - How creative to add dangles to the focal. I see *so many* of these beads and it's the first I've seen like this. GREAT job! Lovely work. I like how you added beaded dangles in the donut focal. Fabulous designs! I really like your blue bracelet. the paper bead bracelet is really cool too. The dangles on the necklace add the right touch. Soup-er job! I'm sure you are glad to be back home from the hospital. Hope you are feeling better every day. I really like your treatment of that focal piece with the pearl dangles. Nice job with your soup. Hope you are feeling stronger and healthier now. My favorite is the blue bracelet, but all your pieces are lovely. Hope you will feel better soon. The purple necklace is my favorite. I really like the beads and the style. The purple necklace is gorgeous! I hope you are feeling better and recover completely. take care. You made beautiful pieces with your soup! Hope you're better soon! Love the blue flower bracelet and the paper beads. I hope you are well soon. Nicely done! I also enjoyed playing with paper beads but they can be a challenge for me! Love your creations, particularly the blue flower bracelet. 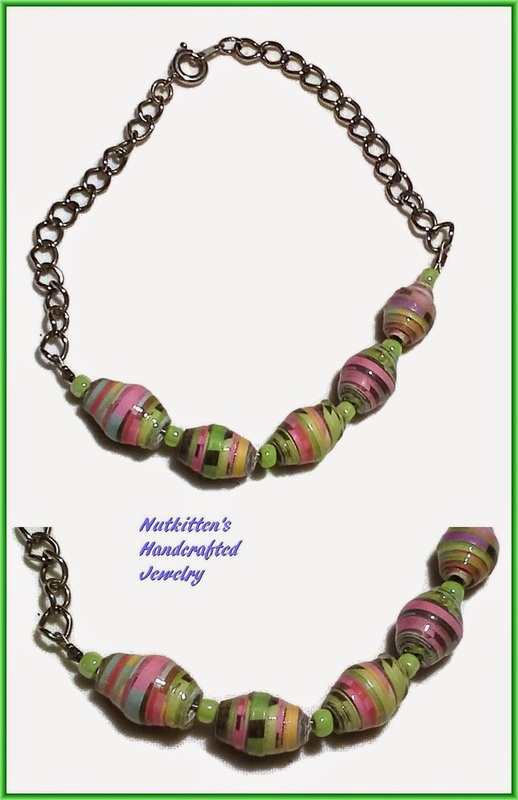 The colorful paper beads are pretty, like how you made a chain bracelet, shows off the beads. What a great soup I like your necklace nice focal and the pretty blue bracelet and I love the colours in the paper beads, they can be used with all kinds of beads and can really add to a design I used some I was sent in my soup necklace! Love your creations! 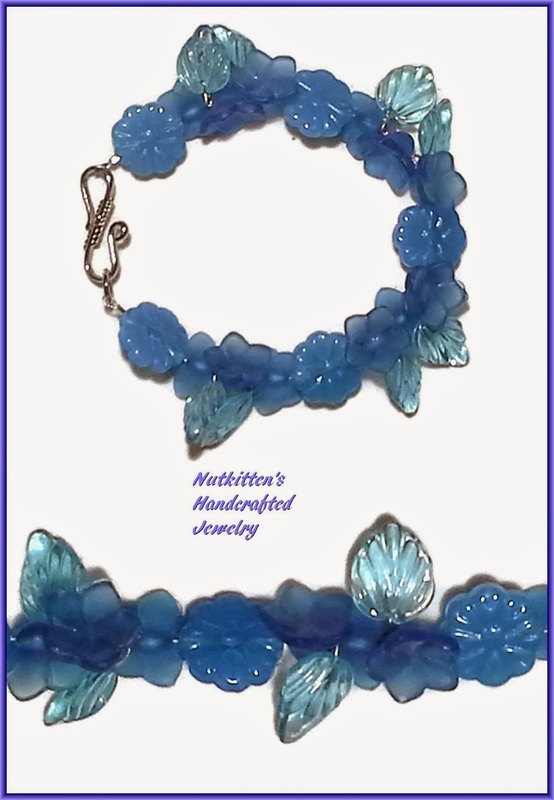 Especially the blue flower bracelet--very pretty! Hope you're feeling better. 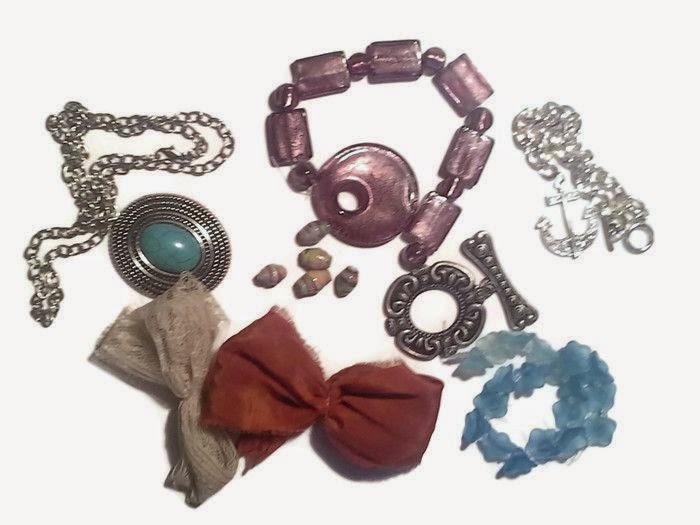 Really pretty pieces!! Great color and flow...nice job! These are really pretty designs. The purple and pink necklace has wonderful texture and movement and the blue flower bracelet has great texture and I love the way you mixed the flat and the more 3d flowers together. And I agree the paper beads are really cute. Nice bracelet! Have a Blessed Day! Very pretty designs and all three very different. Great work! All is well with the world as long as there is purple :) love the necklace! I love the paper beads too....they all have a little different story to tell that makes them so interesting! Blessings to you for better health ! Nice work. Your blue bracelet is very pretty. Purple and blues - what lush colors. Brilliant and great statements. Great job with your soup! Wow, I love the design and colors of the necklace and the beaded bail - I have to make one some time :). The blue bracelet is so luscious and the paper bead bracelet has some of my favorite colors, very vibrant! Hi Tracy, Your purple necklace is beautiful. The blue flowered bracelet is my favorite. You showcased the handmade paper beads very well. I love the flower bead bracelet!